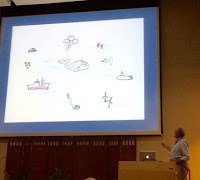 We held our end-of-season gathering on Saturday, 23 March 2019, at the Whitney Auditorium in Marineland. About 90 attended. The food was good, we sold T-shirts and caps (the new nautical red caps were popular), and held a silent auction. Our partners, the Florida Fish and Wildlife Right Whale Aerial Survey Team had a display and gave an informative presentation on their work that included the aims and results of genetic sampling. Next, Jim gave a summary of the season, beginning with a report on our first right whale sighting in 2 ½ years. The new drone program, methods and results, was summarized in a video (more information below). And finally, after the dedicated lookouts had ended, we received a surprise report from the Surf Club―mother #3370 and calf heading south―after we had, erroneously, assumed she had begun the northward migration and departed the area. We have updated our YouTube Channel. Go to YouTube, search on Marineland Right Whale Project, click on the Project logo, and you will see four videos. Two videos with snapshots of our volunteers (2016 and 2019) and two drone videos (8 February and 2 March). Our next season, December 2019 through March 2020, will be our 20th. We are hopeful for a continuing rebound for the right whales. But, as Yogi Berra said, “It’s tough to make predictions, especially about the future.” We’ll be here. Join us if you can! During the season, we will have the 20-year retrospective presentation―not to be missed! Look for our announcements and schedule here in December. We are grateful for the donations that help keep the program viable. If you would like to help support this effort, please make out your tax-deductible check to “ASWH” and mail to: Jim Hain, Marineland Right Whale Project, 9741 Ocean Shore Blvd., St. Augustine, FL 32080-8618. You will receive a receipt acknowledging your donation in return. To each and every one who helped make this season a success―thank you! We thought the whale season was over. Done. Whales gone. But, Thursday morning, 21 March, the phone rang. A mother-calf pair, #3370, off Surf Club. They went slowly south, and by 5:30, they were off Varn Park. 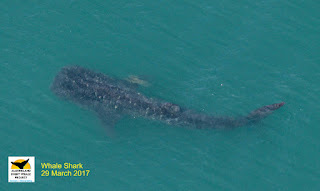 The surprise is that this pair was sighted off Georgia on March 8, headed north. Somehow, and for some reason, they changed their mind. Two weeks went by. Then, the Surf Club sighting! On Friday, 22 March, they were sighted again, just south of Grenada Blvd. in Ormond Beach, still heading south! They continued south at a steady pace until we left them at Main St. Pier in Daytona Beach just before 5 PM. Will we see them when they return north? Keep your eyes peeled just in case! It has been a l-o-o-o-o-o-n-g 2 1/2 weeks since our last right whale sighting. 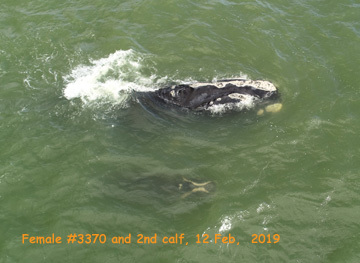 Recall that on Tuesday, 12 February, we had female #3370 and her 2nd calf, down at Highbridge in North Peninsula State Park. 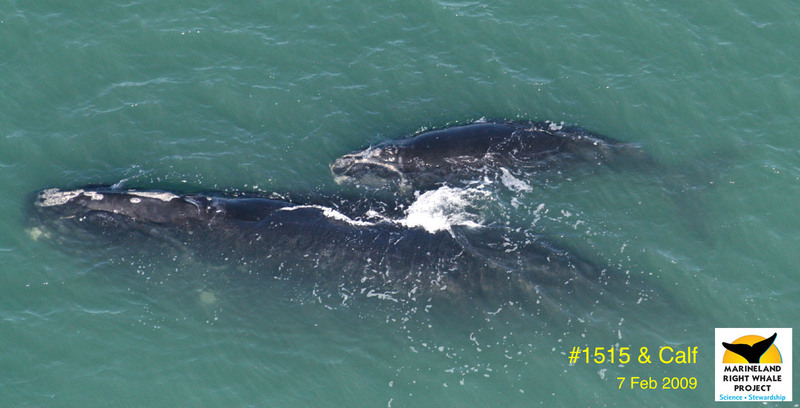 It was a memorable event, as our report was a new mother-calf pair for the season: #6. Then it got quiet―at least for us. But not for mother-calf pair #3370. They traveled farther south, south of Cape Canaveral, and getting down to Sebastian Inlet on 19 February. They then turned north. They were off New Smyrna Beach on 28 February, and off Daytona Beach Shores on Friday, 1 March. Saturday, it was our turn. The phone rang at 07:47 in the morning. Terry Clark and Dave Gustafson reported whales from North Flagler. We were on site at N 16th Street by 08:35. We relayed information to Florida Fish and Wildlife, and their plane arrived about 09:45. We also got in a number of drone flights (image below). The whales were slowly moving back-and-forth, in close, and in calm seas, until about noon. Our season has two more weeks. In some past years, March has been a strong month for sightings. Keep your eyes peeled seaward! The winds were brisk. The seas were lumpy with lots of whitecaps. At about 9:00, the phone rang. Julie Albert, Marine Resources Council, relayed a call: whales in south Flagler, moving slowly south. The initial call came from Linda Grissom, an off-duty team member (her neighbor alerted her and she in turn went to confirm). Team 4 was alerted. They re-positioned. At 09:10 team leader Stephanie York called: yes, further confirmed as right whales. The responders and drone operators got on the road. Lookouts at a walkover at the Flagler/Volusia line reported a possible mother-calf pair. At 10:39, the whales were approaching Highbridge, within the Peninsula State Park. A mother-calf pair was confirmed. In windy and challenging conditions, drone operator Ralph Bundy obtained the identification photos we were looking for. Images were relayed to our colleagues with the Florida Fish and Wildlife Team in Ponte Vedra. Soon, the information came back: Katie Jackson, Florida Fish & Wildlife, identified the mother as Catalog #3370 with her 2nd calf. Wait! The story gets better. 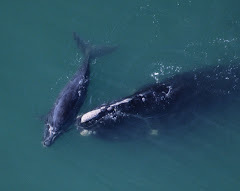 This was a new report for the season—a new mother-calf pair! This brings the total to six—we are inching forward! The whales are like mirages. They appear and disappear. Female #3370 was sighted without a calf on 1 January. At the time, she was with another adult female, #2503, Boomerang, also without a calf. Six weeks later she appears in south Flagler—with a calf. Since the 1 January sighting, Boomerang has also had a calf. The Marineland Right Whale Project has prior experience with this right whale. She was also seen by us in February 2005 and March 2009. There are some unknowns: her age is unknown; her mother is unknown. The drone (and drone operator) has/have once again proved its/their value. On a day when windy conditions precluded the survey aircraft from flying, the Marineland Right Whale Project’s volunteer sighting network, supported by the drone photography, was able to add a noteworthy finding to this season’s right whale research. The research is conducted under NOAA/NMFS research permit #20626. The drone is flown by an FAA-certificated drone pilot. As we begin the 2019 whale season, there is an opportunity for local citizens to help sight whales. We need "eyes on the water" to detect and report the small number of whales (right and humpback) that may occur from January through March. Please print the card below and carry it with you when on the deck of your condo, or on beach walks. There are also a few opportunities to participate in our dedicated survey teams. For the latter, please reach out to marinelandrightwhale@gmail.com. 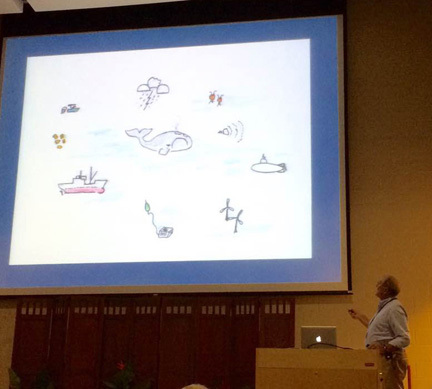 Return to this site for lecture and event schedules, and whale updates. Whale Season is Coming ! * The November 2017 issue of Right Whale News is posted at www.narwc.org. * The training class/kick-off meeting for the season is 30 December 2017, from 2:30 to 4:30, at the Center for Marine Studies, University of Florida's Whitney Laboratory, 9505 Ocean Shore Blvd., Marineland. All interested participants are encouraged to attend. * The surveys begin Tuesday, January 2. * Please check back in this space for the introductory talks in December at your local library and other venues. 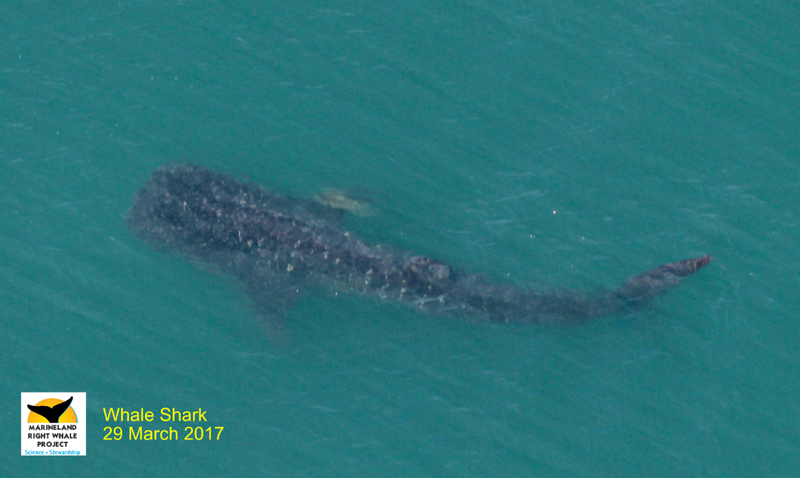 On Sunday, 30 April 2017, an aerial survey team from the NOAA Northeast Fisheries Science Center, Woods Hole, Massachusetts, sighted a new mother-calf pair east of Nantucket, in the Great South Channel. The mother was identified as Catalog #1515, first sighted as an adult in 1985, and currently greater than 31 years of age. She was last seen in 2009 in Florida with a calf. Then, she went unseen for the next seven years. As with Catalog #1414, this individual is rarely seen, and much of her life history is unknown. There are intriguing questions. How is it that these two senior females, with sparse sighting records, converge in the Cape Cod area in 2017 with calves? Where did they come from? Were they simply unsighted in the Southeast US, or, did they have their calves elsewhere? Of the five mothers reported so far for the 2017 season, four are 30 years of age or older. Where are the younger reproductive age females? We have had some history with female #1515. 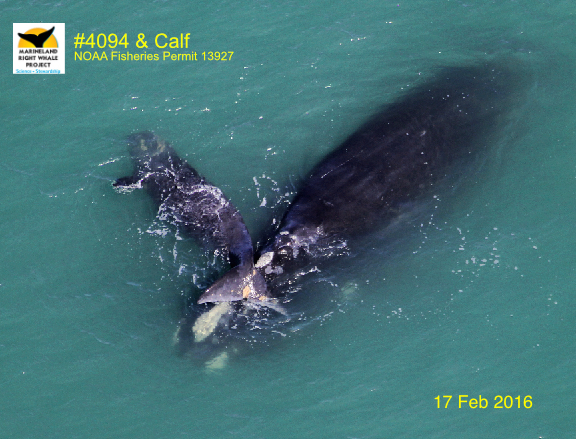 On 7 February 2009 she was photographed by the AirCam team with her calf off Hammock Dunes, seen at right. Later that month, on the 21st, the AirCam team documented them again, off Daytona Beach. All three mother-calf pairs observed in the SEUS this season (but not by us), including the elusive Catalog #1711 and calf, have successfully made the 800-mile migration north and been sighted in Cape Cod Bay. In addition, the Center for Coastal Studies (CCS) discovered a fourth mother, Catalog #1412, in Cape Cod Bay. This female is rarely seen during any of the regular survey efforts; the last report was from Iceland in June 2003.
history with this mother-calf pair; the AirCam crew sighted them on 17 February 2016 about 1 3/4 miles off the beach in South Daytona. This was a young mother with her first calf. After nursing and weaning, a year later, the calf is dead. We gathered to review our 2017 season at the Whitney Lab auditorium on Saturday, 25 March. Jim presented an overview, the issues facing right whales, and questions and possibilities for the 2018 season. 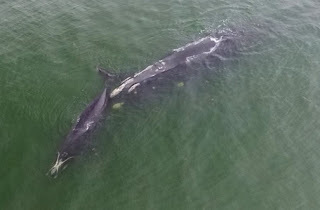 On the morning of 17 April, our colleagues with the Florida Fish and Wildlife Conservation Commission (FWC) received a fisherman’s report of whales off the St. Augustine Pier, heading south. Conducting follow-up interviews, the FWC team concluded that the sighting might be mother-calf right whales and contacted us to assist with verifying it. We made calls and, together with FWC, fanned out between the Pier and Washington Oaks. No whales! On the next day, 18 April, the AirCam team flew a manta ray survey and kept eyes peeled. No whales! Later that day, a call came in to the MRC Hotline from Daytona Beach. This report turned out to be rafts of Sargassum weed. Thanks to the many of you who have contributed, we have reached our Level One Goal ($10,000). A success indeed! To date, a total of 53 have donated, with Survey Team One having the highest number of checks arriving in our hands. For those of you who may have an unused envelope, and are willing and able, your donation checks (made out to ASWH, and mailed to 9741 Ocean Shore Blvd., St. Augustine, FL 32080-8618) will be gratefully accepted. We will continue to send periodic updates during the off-season, and in the fall as we approach the 2018 season. With sea surface temperatures warming significantly, we began our manta ray surveys on Wednesday, 29 March. Flying south on our 1.5 nm track line, abeam of Ormond-By-The-Sea, we spotted a very large whale-shaped form about a half mile off our left side. Banking around to take a closer look, we realized that we were seeing a whale shark, so close to the surface that its dorsal and tail fins were slightly above water, slowly swimming south. This is the first time that we have ever seen a whale shark during our aerial surveys. Of course, we took photos! As the name implies, whale sharks are true sharks and the largest in the shark family. Their skeleton is composed of cartilage instead of bone, but, unlike their fearsome cousins, whale sharks feed on plankton. Females can grow to over 40 ft. The one we saw was probably just under 20 ft., likely a juvenile Still, it was a thrill to see! After evaluating the lack of right whales in the Southeast US and the absence of sightings in our survey area, we have decided to end our survey season two weeks early. The last surveys will take place on Sunday, 26 February. We made a similar adjustment to our survey season in 2012, when we had a total of two sightings of the same juvenile right whale. We are deeply appreciative of the continued diligence and enthusiasm that our volunteers have shown in maintaining survey effort. It is by this dedication that we can conclude that the whales are absent. The Air Cam will continue to survey once a week throughout March. Despite the early end to our season, there is always room for the unexpected. Volunteers, beach goers, mariners, and fishermen, are encouraged to continue to scan the ocean. 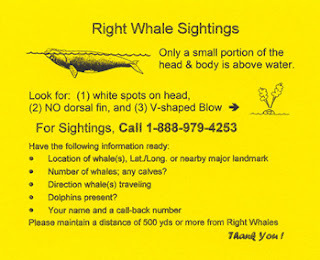 If and when a whale (including a humpback) is sighted, please note time and location, photograph if you are able, and call toll-free 1-888-979-4253 (1-888-97-WHALE), or the Marineland project number, (904) 923-5050. We expect a similar article in the News-Journal this week.